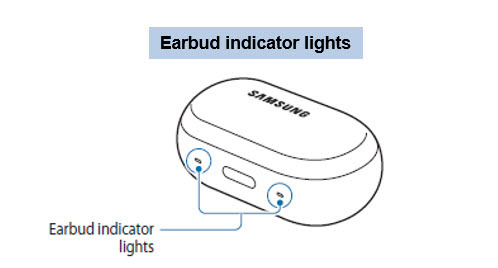 Two earbuds indicator lights are located on the left and right sides of the charging case’s open button and show the charging status of each earbud, respectively. 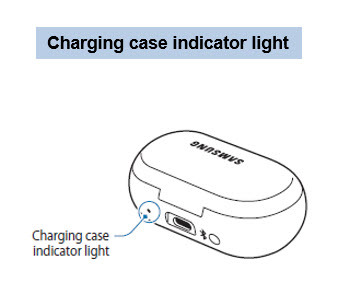 The charging case indicator light next to the multipurpose jack indicates the charging status of the case itself. When you place your earbuds in the case, a LED indicator light on the rear of the case gets turned on for about five seconds. The color of the LED indicator light shows you approximately how much battery power you have left. 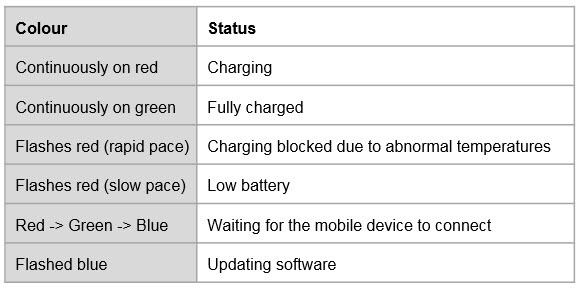 • When you disconnect the power source from the charging case after the earbuds are fullycharged, the green indicator lights will turn off after 30 minutes. • If the indicator lights do not work as described, disconnect the charger from the charging caseand reconnect it.